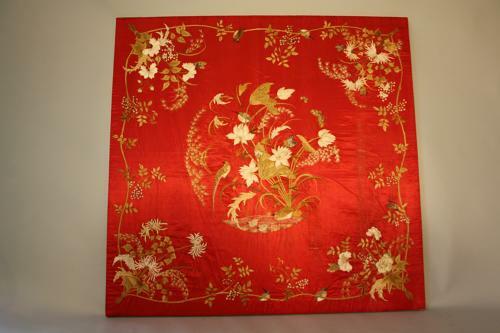 A beautiful hand embroidered textile depicting birds, pheasants and butterflies in lilies and grasses on a cherry red silk background. Chinese made for the European market. c1920. Wonderfully executed. Certain areas of wear visible on this textile which has been mounted on a stretcher and frame.